Are you analytical and enjoy testing out the latest and greatest software and tools out there? Do you hesitate to install the latest version of a set of drivers, software update, etc. or do you just go without even backing up your data? Do your family and friends call you for tech support and helping them with their computers? Well, if you answered yes to any of the above questions then you just might have what it takes to be a beta tester. I enjoy beta testing for several reasons. Getting that early peek at new technology and software is very cool. Getting to know other like minded people who are also in a beta test is superb and I have lifelong folks that I keep in contact with outside of the beta programs I have been in because of that. I like tweaking and exploring software to see how it ticks. Getting in to be a Microsoft Beta Tester used to be so hard (IMHO). I spent about 6 years trying to get in. I can remember back when there was an email alias to Microsoft that you had to send an email to. You would get an automatic reply that had you answer several details about who you were, your background and experience and what program you wanted to test in. Of course back then my goal was to test the Windows operating system. 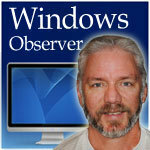 Windows Observer Microsoft, Windows, Windows Observer. permalink. I would like to be a Windows Beta Tester.